So the Port Authority has some news and you’ll never guess what that news is in a billions years. Oh. You got it right! Port Authority officials today warned of a “death spiral” of deeper service cuts along with layoffs and fare increases if Gov. Tom Corbett and the Legislature don’t resolve a statewide transportation funding crisis. CEO Steve Bland said the agency faces a projected $64 million deficit for the fiscal year beginning next July unless state aid is increased and the authority gains significant concessions from its employee union. If the deficit isn’t closed “we’re looking at significant curtailment of night and weekend service” including a full shutdown of the Light Rail Transit system on weekends, he said. Another 40 bus routes could be eliminated. Future rounds of cuts would be like “amputations,” he said. 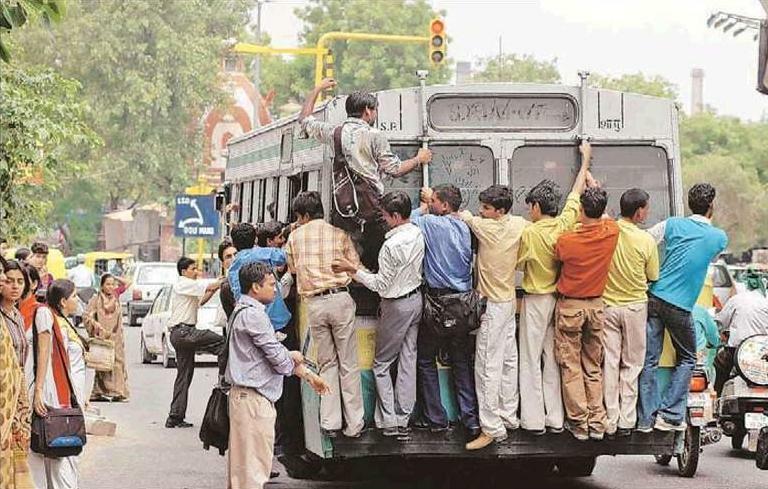 So, to sum up, once again, commuters are screwed and this is what your bus will look like in 2012. Seriously, we might as well just start sewing giant magnets to our clothing and leaping onto passing vehicles. This reminds me of those stories out of third-world countries about once a month where a bus runs off a mountain and 200 people die. And BTW, wouldn’t that be great? They built the gajillion-dollar tunnel under the Al mainly to funnel Steelers fans to and from Heinz Field, and the T will be SHUT DOWN ON WEEKENDS! In related news, Port Authority Transit becomes more bike friendly. They ought to be. Used to be you could walk to your bus stop. Now you need to ride a bike to it. One of the more astonishing things I’ve ever seen was on … I think it was the old Michael Palin series “Pole to Pole,” do I have the ex-Pythonite right there? Anyway, we see a clip of a train chugging through the African savannah with hundreds of Africans SITTING ON THE ROOF of the cars, which apparently was the seat you got when you couldn’t afford to buy a ticket for a seat IN the car. Now I can’t wait to do some trolley-surfing. Not for nothing (and I’m sure some already know this), but “Death Spiral” is an actual term, and a pretty accurate one at that. I would argue that PAT has been in one for years and years now. Seriously, as long as that old guy is passing out quarter billion dollars to our Universities like he’s Oprah, he should toss $100 million to PAT to end the spiral (with change-the-structure strings attatched, of course). Millions for Education vs Millions for transportation. Well, I vote for Education because apparently PAT needs some smarter people running it so they are not in this situation. Haha, I echo budcaddy’s sentiments exactly! He hit the nail on the head! Maybe I’m thinking of something else, but didn’t they find a few years back several traffic barrels turned upside down FULL of meter change, thousands of $$. And wasn’t the drink tax supposed to help with the public transportation stuff. Regardless, the people in charge need to be shown the exit. Is that photo actually a frame from a Gap commercial in New Delhi? Is Onorato still sitting on the drink tax revenue in his hissy-fit-snit? Now THERE’S someone who needs the magnet sewn on and stood out by the Parkway. Rick Taylor referred to the PAT financial summary as “The Matrix of Doom”…. Wait … so if I drink beer at the ballgame tomorrow, I contribute to Onorato’s stash? Classic definition of a dilemma. The great thing about this story is that, like the Port Authority repeating themselves, I can go back and use the same comment I used last time. Also, here’s my latest nomination for Mercer County in the ongoing struggle for awesomeness among counties. The fire department was called, and damage to the structure held to a minimum, in response to a fire at a residence in my community. The fire was started by a 10-year-old girl who was smoking under her bed. As always, I couldn’t possibly make this stuff up. PAT logic makes no sense…. they cut routes so less people will be able to ride buses, then expect more income. People’s frustration is understandable, but everybody needs to take a deep breath and understand what’s going on. Past leadership at the Port Authority made disastrous operational and labor contract decisions in previous decades that dug an enormous hole. The current management team led by CEO Steve Bland has been trying to get things right since 2006. These problems weren’t created overnight, and they won’t be solved overnight either. The biggest cost obstacle the Port Authority faces is retiree healthcare costs. Philadelphia’s transit system has three times more employees, and pays less for health care for its retirees than the Port Authority. And fixing that is not something that current management can do on its own. Nor can management do anything about the fact that the Port Authority is getting less money from the state today than it was getting before the last state transportation “fix” in 2007. The Port Authority has done more to reform itself in the past five years than any other transit system in the country. All of that reform — and more — is necessary, but it’s not enough on its own. Without action from the state and cooperation from the transit union, we’ll be looking a system that’s 30% smaller by this time next year. Thank you Ken – that all makes sense, but is there anything that the citizens of Pittsburgh can do to help? Weird: “Death spiral”,“Cutting into bone and muscle”,“Amputations” are all words that describe the way I feel when my taxes go up to fund the Port Authority.